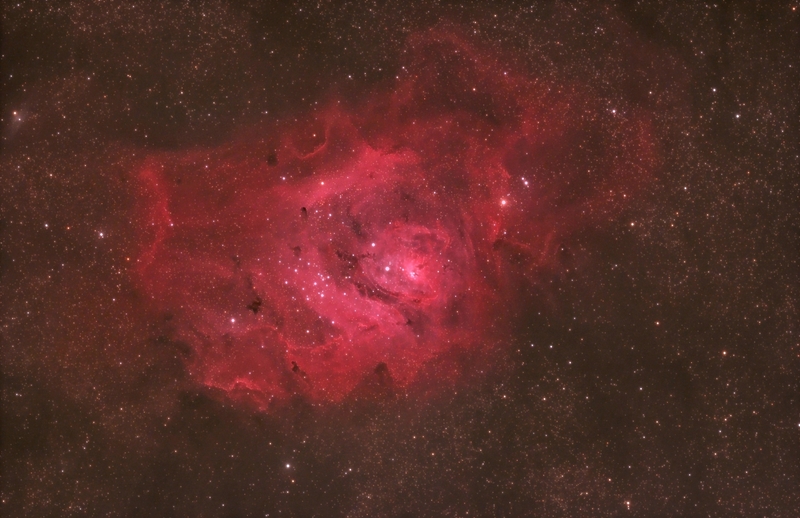 Here is an image of the Lagoon Nebula taken with my SkyWatcher Esprit 120. The conditions were so-so with slightly low transparency and the target was 25 degrees above the horizon at best while the image was taken. The image is a 50% crop of the full image so use your browser's zoom capability to see the full detail. Optics Prime focus of a SkyWatcher f/7 Esprit 120 APO refractor with field flattener. Processing This image was processed entirely in Images Plus. Calibration, stacking, statistical filter applied to reduce noise before stretching. Masked stretching and split star processing used to enhance the image. Masked noise reduction using a frequency domain lowpass filter applied to the DSO layer and then it was recombined with the star layer. Image binned 2 by 2. Final sharpening applied. Since the 60Da has on sensor dark suppression no darks were used in the calibration.